Hermann Julius Oberth (German: [ˈhɛrman ˈjuːli̯ʊs ˈoːbɛrt]; 25 June 1894 – 28 December 1989) was an Austro-Hungarian-born German physicist and engineer. He is considered one of the founding fathers of rocketry and astronautics, along with the French Robert Esnault-Pelterie, the Russian Konstantin Tsiolkovsky and the American Robert Goddard. Oberth was born to a Transylvanian Saxon family in Hermannstadt (Nagyszeben), Austria-Hungary, today Sibiu in Romania. At the age of 11 years, Oberth became fascinated with the field in which he was to make his mark through reading the writings of Jules Verne, especially From the Earth to the Moon and Around the Moon, re-reading them to the point of memorization. Influenced by Verne's books and ideas, Oberth constructed his first model rocket as a school student at the age of 14. In his youthful experiments, he arrived independently at the concept of the multistage rocket, but he lacked then the resources to pursue his idea on any but a pencil-and-paper level. In 1912, Oberth began the study of medicine in Munich, Germany, but at the outbreak of World War I, he was drafted into the Imperial German Army, assigned to an infantry battalion, and sent to the Eastern Front against Russia. In 1915, Oberth was moved into a medical unit at a hospital in Sighișoara (German Schäßburg, Hungarian Segesvár), Transylvania, in Austria-Hungary (today Romania). There he found the spare time to conduct a series of experiments concerning weightlessness, and later resumed his rocketry designs. By 1917, he showed designs of a missile using liquid propellant with a range of 180 miles to Hermann von Stein, the Prussian Minister of War. On 6 July 1918, Oberth married Mathilde Hummel, with whom he had four children. Among these were a son who died as a soldier in World War II, and a daughter who also died during the war when there was an accidental explosion at a liquid oxygen plant where she was in August 1944. In 1919, Oberth once again moved to Germany, this time to study physics, initially in Munich and later in Göttingen. In 1922, Oberth's proposed doctoral dissertation on rocket science was rejected as "utopian". He next had his 92-page work published privately in June 1923 as the somewhat controversial book, Die Rakete zu den Planetenräumen ("The Rocket into Planetary Space"). By 1929, Oberth had expanded this work to a 429-page book titled Wege zur Raumschiffahrt ("Ways to Spaceflight"). Oberth commented later that he made the deliberate choice not to write another doctoral dissertation. He wrote, "I refrained from writing another one, thinking to myself: Never mind, I will prove that I am able to become a greater scientist than some of you, even without the title of Doctor." Oberth criticized the German system of education, saying "Our educational system is like an automobile which has strong rear lights, brightly illuminating the past. But looking forward, things are barely discernible." Hermann Oberth was finally awarded his licence in physics with the same rocketry paper that he had written before, by the University of Cluj, Romania, under professor Augustin Maior, on 23 May 1923. Oberth became a member of the Verein für Raumschiffahrt (VfR) – the "Spaceflight Society" – an amateur rocketry group that had taken great inspiration from his book, and Oberth acted as something of a mentor to the enthusiasts who joined the Society. Oberth lacked the opportunities to work or to teach at the college or university level, as did many well-educated experts in the physical sciences and engineering in the time period of the 1920s through the 1930s – with the situation becoming much worse during the worldwide Great Depression that started in 1929. Therefore, from 1924 through 1938, Oberth supported himself and his family by teaching physics and mathematics at the Stephan Ludwig Roth High School in Mediaş, Romania. A Paraguayan stamp celebrating the 85th anniversary of Oberth's birth featuring Star Trek's USS Enterprise (NCC-1701). In parts of 1928 and 1929, Oberth also worked in Berlin, Germany as a scientific consultant on the film, Frau im Mond ("The Woman in the Moon"), which was directed and produced by the great film pioneer Fritz Lang at the Universum Film AG company. This film was of enormous value in popularizing the ideas of rocketry and space exploration. One of Oberth's main assignments was to build and launch a rocket as a publicity event just before the film's premiere. He also designed the model of the Friede, the main rocket portrayed in the film. On 5 June 1929, Oberth won the first (Robert Esnault-Pelterie - André-Louis Hirsch) Prix REP-Hirsch of the French Astronomical Society for the encouragement of astronautics in his book Wege zur Raumschiffahrt ("Ways to Spaceflight") that had expanded Die Rakete zu den Planetenräumen to a full-length book. The book  is dedicated to Fritz Lang and Thea von Harbou. Hermann Oberth was the first, who when thinking about the possibility of spaceships grabbed a slide-rule and presented mathematically analyzed concepts and designs.... I, myself, owe to him not only the guiding-star of my life, but also my first contact with the theoretical and practical aspects of rocketry and space travel. A place of honor should be reserved in the history of science and technology for his ground-breaking contributions in the field of astronautics. Oberth moved to Peenemünde, Germany, in 1941 to work on the Aggregate rocket program. Around September 1943, he was awarded the Kriegsverdienstkreuz I Klasse mit Schwertern (War Merit Cross 1st Class, with Swords) for his "outstanding, courageous behavior ... during the attack" on Peenemünde by Operation Hydra, part of Operation Crossbow. Later he worked on solid-propellant anti-aircraft rockets at the German WASAG military organization near Wittenberg. Around the end of World War II in Europe, the Oberth family moved to the town of Feucht, near Nuremberg, Germany, which became part of the American Zone of occupied Germany, and also the location of the high-level war-crimes trials of the surviving Nazi leaders. Oberth was allowed to leave Nuremberg to move to Switzerland in 1948, where he worked as an independent consultant and a writer. In 1950, Oberth moved on to Italy, where he completed some of the work that he had begun at the WASAG organization for the new Italian Navy. In 1953, Oberth returned to Feucht, Germany, to publish his book Menschen im Weltraum (Man into Space), in which he described his ideas for space-based reflecting telescopes, space stations, electric-powered spaceships, and space suits. Oberth retired in 1962 at the age of 68. From 1965 to 1967 he was a member of the National Democratic Party, which was considered to be far right. In July 1969, Oberth returned to the United States to witness the launch of the Apollo project Saturn V rocket from the Kennedy Space Center in Florida that carried the Apollo 11 crew on the first landing mission to the Moon. Oberth returned to the United States to view the launch of STS-61A, the Space Shuttle Challenger launched 30 October 1985. Oberth died in Nuremberg, West Germany, on 28 December 1989, just shortly after the fall of the Iron Curtain that had for so long divided Germany into two countries. Statue of Hermann Oberth in Sighișoara at its new location at the old pathway leading from old town (on the hill) to the new town (summer 2017). 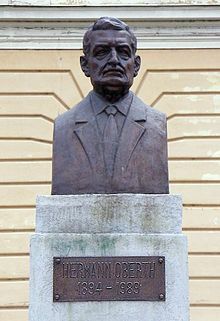 Hermann Oberth is memorialized by the Hermann Oberth Space Travel Museum in Feucht, Germany, and by the Hermann Oberth Society. The museum brings together scientists, researchers, engineers, and astronauts from the East and the West to carry on his work in rocketry and space exploration. The Oberth effect, in which a rocket engine when traveling at high speed generates more useful energy than one travelling at low speed, is named after him. In 1980, Oberth was inducted into the International Air & Space Hall of Fame at the San Diego Air & Space Museum. There is also a crater on the Moon and asteroid 9253 Oberth named after him. The Danish Astronautical Society has named Hermann Oberth an honorary member. The Faculty of Engineering of Lucian Blaga University of Sibiu is named after him. In Star Trek III: The Search for Spock, the USS Grissom was classified as an Oberth-class starship. Several other Oberth-class starships also appeared in subsequent Star Trek films and television series. ^ a b Hermann Oberth Raumfahrt Museum. Oberth-museum.org (1989-12-28). Retrieved on 2015-06-27. ^ Joseph E. Angelo (2003). Space Technology. Greenwood Press. p. 70. ISBN 1-57356-335-8. ^ Winter, Frank (1990). Rockets Into Space. p. 18. ISBN 0674776607. ^ a b c (in Romanian) Jürgen Heinz Ianzer, Hermann Oberth, pǎrintele zborului cosmic ("Hermann Oberth, Father of the Cosmic Flight"), p. 3, 11, 13, 15. ^ a b "Hermann Oberth, Father of Space Travel", at. Kiosek.com (29 December 1989). Retrieved on 2015-06-27. ^ Augustin Maior. 19 October 2016. ^ Oberth, Hermann (1970) . Ways to Spaceflight. NASA. Retrieved 21 December 2017 – via archive.org. ^ "From "The Rocket in Interplanetary Space" to "Frau im Mond" (June 1923 – 1929)". HistoryofInformation.com. Jeremy Norman & Co., Inc. Retrieved 21 December 2017. ^ Ordway, Frederick I., III. The Rocket Team. Apogee Books Space Series 36. p. 36. ^ "Hermann Oberth, 95, German Rocket Expert". New York Times. 31 December 1989. Retrieved 10 April 2008. Hermann Julius Oberth, a pioneer of the space age who worked with Werner von Braun to help develop Germany's V-2 rocket, died on Friday. He was 95 years old. Mr. Oberth died at a hospital in Nuremberg after a short illness, the Hermann Oberth Museum in Feucht said in a statement. ^ Official Website of the Danish Astronautical Society Archived 14 July 2014 at the Wayback Machine. Rumfart.dk. Retrieved on 27 June 2015. ^ Acasă – Facultatea de Inginerie. Universitatea Lucian Blaga din Sibiu. Inginerie.ulbsibiu.ro (20 June 2014). Retrieved on 2015-06-27. 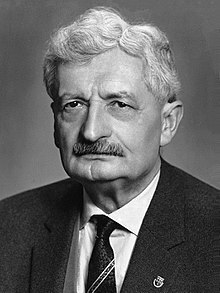 Wikimedia Commons has media related to Hermann Oberth.